Vintage Game Consoles tells the story of the most influential videogame platforms of all time, including the Apple II, Commodore 64, Nintendo Entertainment System, Game Boy, Sega Genesis, Sony PlayStation, and many more. It uncovers the details behind the consoles, computers, handhelds, and arcade machines that made videogames possible. Drawing on extensive research and the authors' own lifelong experience with videogames, Vintage Game Consoles explores each system's development, history, fan community, its most important games, and information for collectors and emulation enthusiasts. It also features hundreds of exclusive full-color screenshots and images that help bring each system's unique story to life. 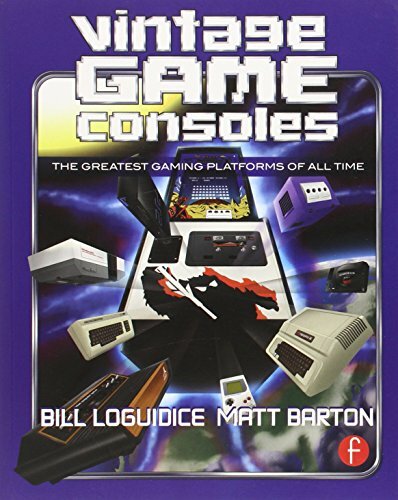 Vintage Game Consoles is the ideal book for gamers, students, and professionals who want to know the story behind their favorite computers, handhelds, and consoles, without forgetting about why they play in the first place - the fun! There are 400 captioned images and 348 overall pages packed with content. The main platforms covered are: arcade, Apple II,Atari 2600 VCS, Atari 8-bit, Mattel Intellivision, PC DOS computers, Commodore 64, ColecoVision, NES, Commodore Amiga, Sega Genesis, GameBoy, Super NES, PC Windows computers, PlayStation, Nintendo 64, Dreamcast, PlayStation 2,Xbox, and GameCube. Of course, many other platforms - and games - are also discussed along the way, as are some of the variations from other regions outside the North American focus of the book. Cover art is by homebrew artist, Nathan Strum, and is inspired by classic videogame magazine, Electronic Games. Bill Loguidice is a critically acclaimed technology author who has worked on over a dozen books, including CoCo: The Colorful History of Tandy's Underdog Computer, written with Boisy G. Pitre. He's also the co-founder and Managing Director for the popular Website, Armchair Arcade. A noted videogame and computer historian and subject matter expert, Bill personally owns and maintains well over 400 different systems from the 1970s to the present day, including a large volume of associated materials. Matt Barton is an associate professor of English at Saint Cloud State University in Saint Cloud, Minnesota, where he lives with his wife Elizabeth. He's the producer of the "Matt Chat," a weekly YouTube series featuring in-depth interviews with notable game developers. In addition to the original Vintage Games, which he co-authored with Bill, he's author of Dungeons & Desktops: The History of Computer Role-Playing Games and Honoring the Code: Conversations with Great Game Designers.